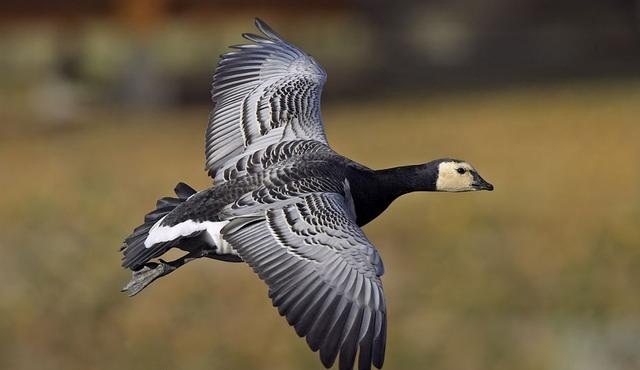 Today I want to write about a bird that is extremely tough, the barnacle goose. These beautiful birds grow to about 70 cm long and have a wingspan of about 1.45 metres. Males are usually larger than females. They get their name as hundreds of years ago people used to think that they were born from the crustaceans called barnacles. This is very weird, but it’s because the geese migrated during summer and the barnacles could still be found and they had no other explanation. They eat grass and water plants that they find in coastal areas. Barnacle geese chicks (called goslings) have one of the hardest starts to life of any baby animal in the world. They are born in nests on the top of cliffs to protect them from predators such as Arctic foxes and polar bears. However, there is no food for them up there, so after a couple of days, the chicks have to jump off the cliff, falling hundreds of feet onto the rocks below. It’s incredible that any survive, but most of them do, and they follow their parents to feeding areas to grow up. Despite the harsh conditions that they live in and their difficult start to life, barnacle geese are quite common and can be found throughout the Arctic region in Greenland, the United Kingdom, Scandinavia, Russia and the Netherlands. Are there any other interesting facts that you would like to share about barnacle geese?